Here is a video of Australian rider Clinton Moore at the X Games trying the 720 trick and failing in the attempt. Some guys tried to help him after his fall but Moore's bike hits him and he goes down again. NBA commissioner David Stern seemed to have a grand time Thursday night at the NBA Draft even though he was booed loudly and often throughout the night. Stern had a smile on his face the whole time and seemed rather amused by all the boos. During ESPN's NBA Draft coverage on Thursday night, ESPN's college analyst Andy Katz was talking about Jared Sullinger's bulging discs in his back but Katz slipped up and said "bulging dicks." Here is the video of Katz's embarrassing mistake on the air. Is NBA Draft prospect Jet Chang the next Jeremy Lin? Lin went undrafted when he came out of college but Chang has a chance to be taken in the second round of the NBA Draft on Thursday night. Chang has a sweet jumper and has looked well in the pre-draft workouts. Chang is 6'4 and played for BYU-Hawaii in college. Here is a new video from Terry Richardson starring the one and only Kate Upton. In the video, Upton showcases her many talents such as dancing, shooting hoops, wearing a wet t-shirt, and hula hooping. During the Miami Heat celebration, Juwan Howard got on the mic and said that the Heat "shocked the world" even though I don't think many fans were shocked that the Heat became NBA champions. Howard then starts doing the Cabbage Patch much to the delight of his teammates. Nike debuts new Lebron James ad "The Ring Maker"
The Miami Heat defeated the Oklahoma City Thunder in five games in the NBA Finals and Nike has already debuted their new LeBron James ad called "The Ring Maker." Check out this very cool one minute clip and congrats to LeBron for winning his first NBA title. If the Thunder had won the title, this ad would have never aired. Here is an old video of Mike Miller swishing three-pointers inside a gym. Miller went 7-8 on threes tonight to help the Miami Heat win the NBA Finals over the Oklahoma City Thunder in five games. Here is a crazy video of a road rage fight in the streets captured by another car just driving by in another lane. How odd that the music played in the cameraman's car is a song called "Take care" by Drake and Rihanna? The man that got knocked out should not have tried to fight the three men all by himself. Sure it was one on one in the beginning but he had to know that the two other guys would not just be bystanders in the brawl. The great Russian fighter Fedor Emelianenko knocked out Pedro Rizzo today in the first round. Here is the full video of the fight. Video: E-40 raps for the San Francisco Giants "Vote 25 on it"
Bay Area rap legend E-40 recently put down a rap for the San Francisco Giants called "Vote 25 on it" which is a song telling fans to vote the Giants players like Buster Posey and Melky Cabrera into the All Star game in July. E-40 and a young girl named Ursula did the track with Ursula doing the chorus. If the beat sounds familiar to you, it is because they took the instrumental from the old hit song "I got 5 on it" from The Luniz. San Francisco Giants pitcher Matt Cain was presented with a commemorative samurai sword from Mizuno yesterday before his start against the Angels. Mizuno is a Japanese sports equipment company that sponsors Cain. 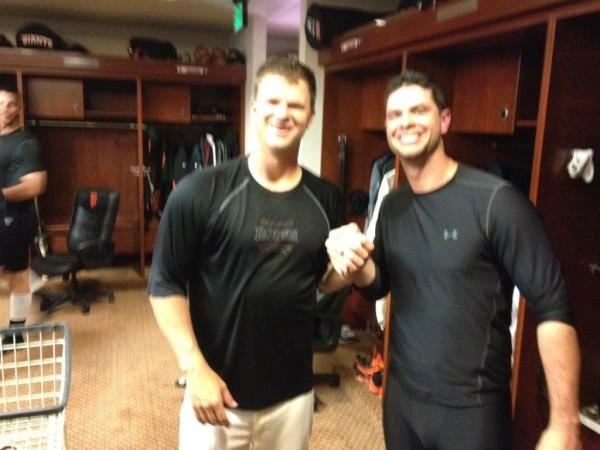 Mizuno gave Cain the sword in honor of his perfect game against the Houston Astros last week. Cain said the sword would be awesome to have in his house. After the ceremony, Cain pitched five innings while giving up three runs to beat the Angels 5-3. Check out the videos below of Cain and his sword along with Cain doing the Top Ten list on David Letterman. Here is the video of San Francisco Giants pitcher Matt Cain doing the Top Ten on the Late Show with David Letterman on Monday night. Cain threw a perfect game last week against the Houston Astros and did the "Top ten things he wants to achieve now that he has thrown a perfect game" list. Some of the things on the list include catching a line drive with his mouth, fixing the economy, and pitch an inning without his pants. Letterman made a mistake during the segment when he said the Giants are in the "NFL West." After doing the Top Ten list, Cain started the game against the Angels last night and went five innings while giving up three runs. Cain and the Giants got the win 5-3. Texas Rangers broadcaster Dave Barnett lost his mind Monday night during the Rangers vs. Padres game in San Diego. During the eighth inning, Barnett said the "go-ahead run is at fifth" even though there is no such thing as a fifth base in baseball. Barnett proceeded to then talk about a "botched robbery" and "henchmen." Barnett sounded like a man drunk. What happened? Who knows? It could be a medical condition. All I know is that the fans watching the broadcast were probably very confused. Here is a hilarious video of Jimmy Kimmel Live's security guard Guillermo at Media Day at the NBA Finals. Guillermo mispronounces every player's name and asks them inappropriate questions. He calls Derek Fisher "Darryl Fisher" and Dwyane Wade "Dwyane Wayne." The security guard also has an "exclusive" with LeBron James and seems to piss off James Harden as well. Did anyone catch LeBron James giving his sweaty headband to a female fan in the stands after his post-game interview with ABC's Doris Burke? The female fan appears to ask James for the headband and he kindly gives it to her. The woman then proceeds to proudly put on the headband. Maybe the NBA and LeBron can make a commercial out of this just like Coca Cola did with Joe Greene of the Pittsburgh Steelers when he gave his towel to a young boy after a game? A fan at the U.S. Open stood in front of the NBC cameras during the Bob Costas interview with Webb Simpson and started making bird noises until he was yanked off. Simpson tells the fan to "enjoy the jail cell pal." Lakers' forward Metta World Peace aka Ron Artest tweeted this during Game 3 of the Miami Heat vs. Oklahoma City Thunder series on Sunday night. Of course World Peace is referring to James Harden although he doesn't mention Harden's name in the tweet. In Game 3 of the NBA Finals, Harden had a bad game and made only two shots on 10 attempts. He also had some bad turnovers as well as the Thunder lost 91-85 to the Heat in Miami. Some fans replied back to World Peace by saying that Harden has no brains due to World Peace giving him a concussion while other fans called him out for hating on Harden. If you forgot what World Peace did to Harden earlier this season, here is the video of the elbow incident. New York Giants quarterback Eli Manning threw out the ceremonial first pitch at Citi Field to Mets third baseman David Wright on Father's Day. Manning was holding his young daughter when he threw out the first pitch. I know it is the offseason in the NFL but take a look at Manning's waist in his Mets jersey. Does that look like a big gut or what? Manning can get fat and gain a few pounds in June but he better be in shape in the fall if the Giants want to repeat as Super Bowl champs. Take a look at the video and see Manning's big belly for yourself. Yu Darvish and fellow Texas Rangers' rookies sing Shania Twain song "Man, I feel like a woman"
During a kids' charity event last month, the Texas Rangers made three of their rookies, Yu Darvish, Robbie Ross, and Brandon Snyder put on dresses and perform Shania Twain's song "Man, I feel like a woman." Carlos Santana of the Cleveland Indians collided with a huge man in the stands while trying to catch a pop up earlier this afternoon. Have you ever bet on a game and lost and wanted to punch a wall or a person to make you feel better? A 29-year-old man from the U.K. punched a female Ladbrokes cashier in the face after finding out he lost his small wager on Portugal to beat Germany in Euro 2012. When the cashier told him he lost his bet, he started to spew profanities before punching the cashier. If Portugal had won, the bettor would have won only $1.51. Talk about a temper. It's one thing to get angry if you lost a lot of money but if you are placing small bets and lose, there is no reason to act violent. Here are some pictures of the man punching the cashier. Here is a funny video of former Utah Jazz point guard John Stockton walking around the streets of Barcelona with his family and no one recognizes him. If Michael Jordan or Magic Johnson was walking on the street, I am sure more fans would recognize them but Stockton isn't very tall and big so he blended in with the rest of the crowd. NBA TV aired a documentary on the 1992 Dream Team last night but not everyone gets that premium cable channel. Here is the video of San Francisco Giants outfielder Gregor Blanco making a diving catch to rob Houston Astro Jordan Schafer of a hit. This catch helped keep Matt Cain's no-hitter and perfect game intact. Cain went on to get his perfect game and no-hitter as the Giants won 10-0. San Francisco Giants pitcher Matt Cain threw a perfect game and no-hitter against the Houston Astros on Wednesday night. It was the first ever perfect game by a Giants' pitcher. Here is the final out. Cain dominated the Astros' hitters all night long and struck out 14 batters. Cain tied Sandy Koufax with the most strikeouts in a perfect game. Cain almost had a no-hitter in April against the Pittsburgh Pirates but Pirates' pitcher James McDonald hit a single off Cain. There were some close calls though as Chris Snyder almost hit a homer but left fielder Melky Cabrera made a great catch. In the seventh inning, Gregor Blanco made a diving catch in right field to rob Jordan Schafer of a hit. This is the fifth no-hitter thrown against the Astros in their history. The Giants won the game 10-0. It was the 22nd perfect game in MLB history. Here is the post-game interview with Cain. Before the game, Cain participated in a driving competition against pro golfer Dustin Johnson. NBA commish David Stern to Jim Rome: "Have you stopped beating your wife yet?" Radio host Jim Rome asked NBA commissioner David Stern if the NBA lottery was fixed and Stern didn't like the question and asked Rome if he has stopped beating his wife yet. This parlay wins 200 for every 100 risked. Here is a very creative parody of Carly Rae Jepsen's hit song "Call me maybe" called "Call me KD" which is a tribute to Kevin Durant. Is everybody ready to Thunder Up now? Here is a video of boxing fans leaving the MGM Grand Arena on Saturday night after the controversial decision by the judges awarding the split decision to Timothy Bradley. A lot of fans were saying that Manny Pacquiao won the fight but there were some fans that were saying Bradley won as well. The rematch is set for November 10. This catch in right field by Seth Smith of the Oakland A's is one of the best catches I have seen all season. Aaron Hill of the Diamondbacks thought he hit a homer in the second inning on Friday night but Smith leaped up and caught the ball. Smith timed his jump very well and robbed Hill of a home run. Talk about some hops! The Diamondbacks won the game 9-8 thanks to a dramatic three-run homer by Ryan Roberts in the bottom of the ninth inning off A's closer Brian Fuentes. Here is the final out of the game by Seattle Mariners pitcher Tom Wilhelmsen to finish off the combined no-hitter by six pitchers. The Mariners won the game 1-0 against the Dodgers. Kevin Millwood started the game for Seattle but he had a groin injury and did not come out to pitch the seventh inning. The other Mariners who pitched tonight were Charlie Furbush, Stephen Pryor, Lucas Luetge, and Brandon League. None of these guys are household names. This is the third no-hitter in Mariners' history. The other two pitchers who had no-hitters were Randy Johnson and Chris Bosio. Logan Forsythe had quite a night last night for the San Diego Padres as he helped his team on defense and offense to help beat the San Francisco Giants 6-5 on Monday night. Check out the two videos below of Forsythe's amazing night. In the first video, the second baseman makes a perfect throw from the outfield grass to gun down Angel Pagan at third base. When Joaquin Arias hit the ball to the right side of the field, it looked like Forsythe had no play at first or third base. In the second video, Forsythe comes to bat in the ninth inning with the scored tied 5-5 and hits a dramatic walk-off homer into the second deck in left field to win the game. Here is a funny video of Pittsburgh Steeler linebacker LaMarr Woodley getting pranked at his bachelor party in Las Vegas. A snake and a very fat stripper named "Sweet Cheeks" participate in Woodley's party. U.S. soccer star Hope Solo is ready for the 2012 London Olympics. Here is a workout video of Solo training hard to bring the gold to the United States. MLB Draft Prospects perform "Call Me Maybe" parody called "Draft Me Maybe"
Five top MLB Draft prospects in today's draft performed a video for a "Call me maybe" parody called "Draft me maybe." I have no idea who these guys are or who sang this parody of the Carly Rae Jepsen song but it's pretty creative. WMTW news anchor Meghan Torjussen doesn't know much about sports as you can tell from watching the video below. Torjussen tells the WMTW viewers in Maine that the Celtics vs. Heat game ended in a tie. The Game 4 contest between these two teams did not end up in a tie of course since there is no such thing as a tie in the NBA. It was quite an embarrassing moment for WMTW and Torjussen. Video: Pau Gasol of the Lakers watches spinal surgery at Children's Hospital of L.A.
Los Angeles Lakers forward Pau Gasol recently visited Children's Hospital of Los Angeles to view a patient's spinal surgery. The video is below and I must warn you that parts of the video are very graphic. A lot of fans don't know that Gasol was a medical student at the University of Barcelona and has great interest in the medical field. At the end of the video, Gasol talks about wanting to be a Laker next season but that he knows his future is not in his control. Texas Rangers outfielder Nelson Cruz is one strong man. Check out the video below of his homer against the Angels yesterday afternoon in the seventh inning. The pitch he hit off Angels reliever Bobby Cassevah went 484 feet and is the longest home run by a player this season. The two-run homer came on a 3-0 count and gave the Rangers a 5-2 cushion over the Angels. The Rangers went on to win the game 7-3 and the win snapped a four-game losing streak. Former WWE wrestler George "The Animal" Steele "threw" out the first pitch at a Rochester Red Wings game over the weekend. The 75-year-old wrestling legend chewed on the ball first before throwing what was left of the ball to the catcher. In Steele's wrestling days, his gimmick was biting the turnbuckle pad in the ring and chewing it up. Who knew that hip hop and R&B artist Chris Brown could ball? Here is a video of Brown throwing up a nice alley oop pass to John Wall for the dunk on Sunday in a LA Drew League game. The Drew League is a summer basketball league where a lot of NBA players participate in. Kobe Bryant and James Harden were going against each other in some games last summer in the Drew League. Brown and Wall are part of the team called "Team Money Gang" which also has rapper The Game, DeMar DeRozan, Paul George, and Metta World Peace. Here is the video of the highlight-reel head kick by Justin Lawrence to knock out John Cofer at the UFC show "The Ultimate Fighter Live Finale" in Las Vegas last Friday night. The incredible knockout happened in the third and final round of the fight. Lawrence was awarded "Knockout of the Night" as well as "Fight of the Night." Lawrence definitely will fight again in the UFC and the future looks bright for the 22-year-old fighter if he continues to deliver knockouts and wins. San Francisco Giants third baseman Pablo Sandoval is facing possible sexual assault charges in Santa Cruz County according to this report from Giants' beat reporter Andrew Baggarly. Sandoval is on the disabled list with an injury to his wrist. He is set to begin a rehab assignment with the San Jose Giants and should be off the disabled list in a few weeks. The Panda's attorney, Eric Geffen, told CSN Bay Area that, "On Friday, June 1, Pablo Sandoval voluntarily met with the Santa Cruz County Sheriff’s Department related to a consensual, personal relationship of a sexual nature that took place on that day." According to Baggarly's report, his sources confirm that a woman contacted the police and said that she was too drunk to give sexual consent. Sandoval has a young daughter from a previous marriage and went through a divorce a few years ago. This is bad news for the Panda and the Giants since he is their biggest star on the team. Sandoval's reputation and image will take a hit as well due to these charges. The Giants don't need any off-field distractions and these charges could affect Sandoval at the plate. The Giants are currently in second place in the NL West but have gained ground on the Dodgers in the past few days. I don't usually post picks that often but I have a solid winning record on this blog as well as on Twitter. Here are today's picks. Good luck. Under 8 A's vs Royals. The A's can't hit or score and the A's get their ace back today in Brandon McCarthy. He is only going to throw around 85 pitches but the bullpen has been solid as well. Look for a low-scoring game. I might have more picks later. If you want me to post picks daily, let me know with some comments. New York Mets pitcher Johan Santana threw 134 pitches and got the first no hitter in team history on Friday night against the St.Louis Cardinals. Left fielder Mike Baxter saved Santana's no-hit bid in the 7th inning by making a great catch in the outfield while crashing into the wall. Here is the video of the last out in the 9th inning. The Mets won the game 8-0. San Diego Padres outfielder Cameron Maybin got pranked by his teammates Yonder Alonso and Andy Parrino recently when the team was in New York to play the Mets. The three teammates went to a burger joint in New York and Maybin ordered a huge burger while Alonso and Parrino ordered something else. While they were eating their meals, a few of the patrons ran to the bathroom and the waitress told Maybin that they had to throw up and some had diarrhea due to the same burger that Maybin was eating. Maybin is worried because he doesn't want to get sick and throw up. He also knows he has a game later that day. Check out the funny video below. Here is a video of Thabo Sefolosha taking down Manu Ginobili with his forearm in the first quarter of Game 3 of the Thunder vs. Spurs series. Sefolosha was called for a flagrant foul. The Thunder won 102-82 and are now down 2-1 in the series. A young girl named Snigdha Nandipati won the National Spelling Bee on ESPN last night by correctly spelling out the word "guetapens." Unfortunately for ESPN reporter Samantha Steele, she wanted to present the trophy to another female contestant instead because she thought that contestant was Nandipati. Check out the funny video below as well as the video of Nandipati spelling out "guetapens." If you think spelling "guetapens" is difficult, try spelling the winner's full name.